A layup farm is a rehabilitation center for horses recovering from lameness or surgery. After a horse leaves a veterinary hospital, if he is not ready to go home yet, a layup farm can be a good solution. 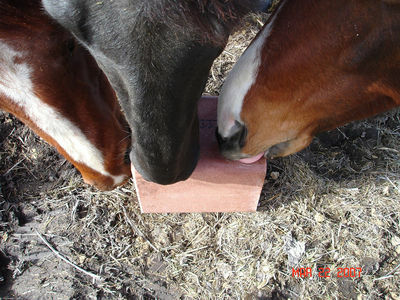 Horses are checked regularly and cared for well. At high-end layup farms, horses might also benefit from spa-like facilities like swimming pools, veterinarians in residence, and an arsenal of high-tech lasers, magnetic devices, and herbal rubs. The most common residents of layup farms are racehorses. Many of these horses do not have a home besides the stalls at a track. When they are not in a condition to race, their trainers will fill those stalls with other horses who can race. The injured horse may then be boarded at a layup farm until it returns to racing. Some layup farms specialize in giving racehorses a much-needed break from racing, even though they are not recovering from any illness or injury. These farms are staffed by grooms or trainers with occasional visits from a vet. Show horses may also find their way to layup farms. Although they may have a home base, they travel frequently and may be injured far away from home. In that case, it may be advisable to house the horse at a layup farm until it is well enough for the long trip home. If your horse lives at home with you, consider whether he will recover best in his own stable or at a layup farm. 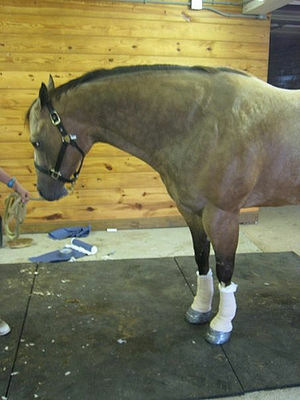 Some questions to ask yourself are: Are you qualified to care for your horse while he recovers? Do you have the time necessary to give him the proper care? Are you able to handle the sights and smells accompanying injuries? If you answered yes to all these questions, your horse will benefit from the extra love and care you will give him. If your horse is being treated at home, consider occasional visits from a massage therapist and be in constant touch with your vet.